by PJ Yerman For massive Star Wars fans like me, December has become more than just the holiday season. It’s “New Star Wars Movie Month,” something followers of this epic cinematic saga have waited nearly 40 years for. Gone are the days of tapping your foot for three years between films (and 16 between trilogies). The rich mythology of the Star Wars galaxy will now be tapped into on a yearly basis… at least until Star Wars goes the way of the superhero movie, oversaturating the market with a constant stream of lightsabers, droids, and wookiees. But this is only the second film in two years, so I’m still riding the high! The Force was awakened last year, and now it’s going rogue. Rogue One: A Star Wars Story is the first of Lucasfilm’s standalone Star Wars movies (separate from the “saga” or “Episode” films) since Disney’s acquisition of the company in 2012. The story chronicles a band of brave Rebel Alliance soldiers who, just prior to the events of Star Wars: Episode IV, attempt to steal the plans to the Death Star, the Galactic Empire’s moon-sized battle station which holds enough power to destroy an entire planet. The fact that this is the synopsis for a film released in 2016 makes me all kinds of happy. The film is directed by Gareth Edwards and stars Felicity Jones as loner-turned-Rebel-fighter Jyn Erso, as well as a slew of others. What slowly becomes apparent while watching Rogue One is that it is unequivocally a standalone film set in the Star Wars galaxy. For one thing, the opening scene (which excludes the iconic crawl text and booming John Williams fanfare), is set in a flashback — a storytelling device never before employed in a Star Wars film — 15 years before the Death Star plans are stolen. The tone is undoubtedly darker and less adolescent than that of the episodic films. Depth is given to the morality of the Rebellion, which, for the last 40 years, has been portrayed as the squeaky clean, morally good heroes who fight to bring peace and freedom back to the galaxy. However, this film explores the Rebels who have had to do terrible things to support the cause they believe in. Spies, insurgents, and assassins wear Rebel helmets as well as stormtrooper armor, and I applaud screenwriters Chris Weitz and Tony Gilroy for making the bold decision to put some skeletons in the Rebellion’s closet. Where Rogue One really makes its mark on the franchise is in its refreshing visual palette. We’re taken to planets and environments unique to this movie, but still very believably a part of the Star Wars galaxy. The standout location has to be where the climactic battle takes place, the beach planet, Scarif; the combination of crystal blue waters, green palm trees and white stormtroopers is nothing short of breathtaking. The way that Edwards handles these gorgeous environments is impressive. The camerawork is grounded and handheld, always focusing on our heroes, as opposed to showing off the scenery around them. A handheld camera has always been frowned upon in the visual history of Star Wars; Lucas established a very robust style of cinematography that hasn’t changed throughout the previous seven films. Unlike The Force Awakens, this movie isn’t handcuffed by the need to live up to the legacy of the rest of the saga, freeing it up to make more innovative choices. What does live up to the legacy, or at least my expectations, is the space battle that’s fought over Scarif, a welcome element to an already action-packed third act. The effects are so convincing, as the giant Imperial Star Destroyers reminded me of the models built for the original films. It’s a perfect blend of old school filmmaking flourishes and new school spectacle. And if anyone can deliver spectacle, it’s the director of Godzilla. Now let’s touch on the characters that occupy this new vision of Star Wars. Our lead, Jyn Erso, is the daughter of a reluctant scientist named Galen Erso (Mads Mikkelsen) — a man taken from his family and forced to design the Death Star’s superlaser by the Empire’s Director of Advanced Weapons Research, Orson Krennic (Ben Mendelsohn). As much as I enjoyed Jyn’s heroic tendencies and her ability to give a rousing pre-battle speech, the performances given by Mikkelsen, and especially Mendelsohn, whose every line is delivered dripping with eloquent pompousness, may be the best I’ve ever seen in this franchise. Jones has one particularly heart-wrenching scene to rival this, but that’s beside the point. Unfortunately, Galen and Krennic’s interactions are limited by the plot’s need to move along. For über nerds like me, extra reading material is offered in the form of the canon book Catalyst by James Luceno, which further fleshes out their relationship, something I consider to be one of the film’s flaws (that I’ll dive into a little later). 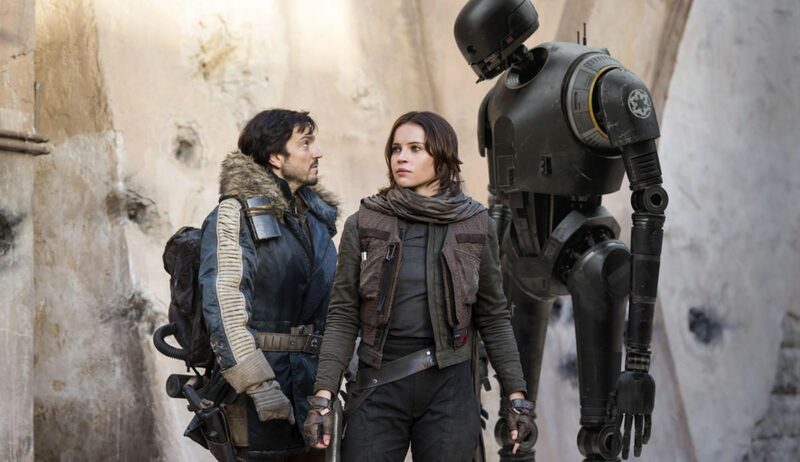 Other characters that really shine are Captain Cassian Andor (Diego Luna) and his robotic counterpart, K-2SO (Alan Tudyk), a reprogrammed Imperial droid who serves as Cassian’s sarcastic co-pilot. Most of the comedic relief is provided by the droid, which thankfully serves as a way for the audience to actually care about a character with wires and circuits for a brain. I would consider him the anti-C-3PO, where overly rational neuroticism is replaced by snarky earnestness to create a genuinely sympathetic personality. Cassian, though, is possibly my favorite character in the film. He’s one of the Rebels who toes the line between soldier and terrorist, allowing the sacrifices he’s made for the good of the galaxy to show on his face like moral scars. Luna is also the first actor of Mexican heritage to portray a Star Wars character — this coming in a film that sees a much more diverse group of heroes represented on screen. Riz Ahmed, who plays defected Imperial pilot Bodhi Rook, is of Pakistani descent, and Donnie Yen and Jiang Wen, who play blind Force-believer Chirrut îmwe and his machine blaster-toting bodyguard, Baze Malbus, respectively, both hail from China. The last character I want to address is a bit of a spoiler, so I’m not going to say who it actually is. What I will say is that it’s a character from a previous Star Wars film that was portrayed by an actor who has since passed away. Instead of recasting the role, the visual effects wizards at Industrial Light & Magic recreated the actor’s face using archival footage; it appears as though a new performance is being given by an actor who’s been dead for over 20 years. This is proving to be a very divisive decision and for the most part, I understand why. For the character’s first scene especially (he’s in at least three or four), the facial technology is so jarring that it actually distracts from the imperative dialogue he’s delivering. It’s not that the effect is bad or poorly executed, it’s just that we haven’t quite gotten to the point where digital characters seamlessly blend in with real human actors. We’re not too far down the road from the “uncanny valley” reaching a turning point, but for now, while not perfect, this is as realistic as a CGI human face can get. What I appreciate is that the filmmakers were willing to take the risk. These standalone films shouldn’t be as sacred as the epic nine-episode arc of the Skywalker story. In some ways, Rogue One serves as a serious step forward for performance capture technology enhancement, much like The Lord of the Rings was for motion capture. If Star Wars is known for anything, it’s revolutionizing the visual effects industry. Nothing new here. Okay, last character for real this time. Darth Vader is in this movie, and that’s not a spoiler because he’s been in the trailers. He plays a very small role in the story and is on screen for a very short amount of time. When he does show up though, it’s impossible to miss. Seeing him is well worth the price of admission. Seriously, his scenes are awesome. I’m going to stop geeking out about Vader now and start addressing some of Rogue One’s negatives. The most glaring setback is that, while non-Star Wars fans can still enjoy themselves, there’s a lot of schema involved with getting everything out of this movie that it has to offer. For a fan like me, the experience is heightened by picking up on all the little easter eggs planted by Edwards. Characters and locations from the prequel films, original trilogy, and animated television shows have either brief cameos or are mentioned in passing. For the uninitiated, these scenes can easily feel hollow and unmotivated when fan service takes precedent over story. The winks and nods aren’t super glaring, but their presence is definitely felt. Sometimes they add, other times they detract; it really depends on how big of a Star Wars fan you are. Another small problem has to do with the character played by Forest Whitaker: armorclad Rebel extremist Saw Gerrera. Most of his screen time is during the second act (undoubtedly the weakest act of the film). We are forced to spend time with Whitaker putting on a strange, straggly accent and unleashing odd mind-scrubbing squid monsters on victims that fall prey to his paranoia. Unlike the central band of Rebels, Saw isn’t given any cohesive arc and I was left wanting more from him during the time between the prologue (where he makes a brief appearance) and now. This brings me back to my previous point. If you want to know more about Saw, he also appears in the Catalyst novel as well as in the Star Wars animated series, The Clone Wars — both of which significantly flesh out his character and motivations. None of that can be found in Rogue One. It’s up to you whether or not you want a homework assignment after seeing the movie. Despite these flaws, I enjoyed the hell out of Rogue One. I walked out of the theater with a feeling that was different than any other I’d felt after watching a Star Wars installment. This feeling was a sense of joyous surprise mixed with a profound sadness (in the best way possible). Rogue One is the first film in the franchise that is purely about the sacrifices of war and the tragedy of battle. It’s been fascinating to watch how Star Wars evolves with each passing film. 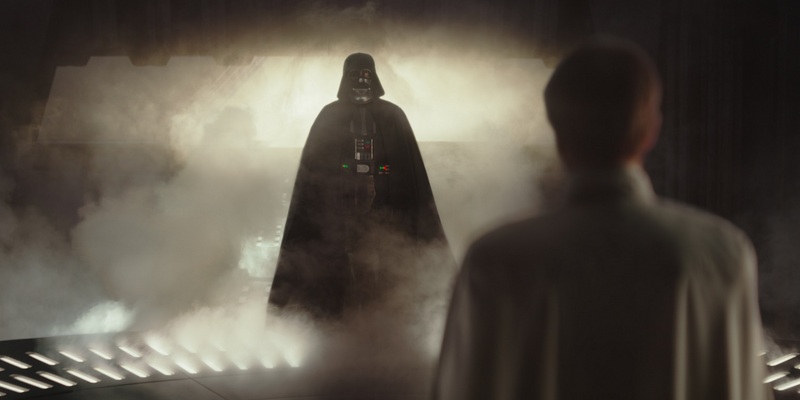 Ever since The Empire Strikes Back, when Darth Vader reveals that he is Luke’s father, our perceptions of characters and events have been continuously altered, for better or worse. Rogue One continues this tradition, doing everything from rationalizing 40-year-old plot holes, to changing characters’ future motivations by providing crucial backstory. As a self-professed Star Wars pedant, this makes me very excited for what’s to come. Rogue One: A Star Wars Story is intense, dark, and shocking, boasting incredible performances, nail-biting action, and plenty of fan service. The Force is indeed strong with this one.